SGB Pokémon: Blue Version (USA/Europe) in 1:51:06.5 by Tilus. Pokémon is a phenomenon that made itself very famous in a short time a few years ago. 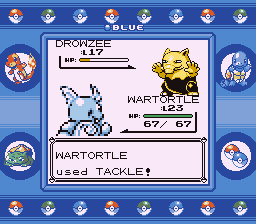 Pokémon Blue is part of the first generation of the games of that series that were made. Up until this day, thousands of Pokémon fans have analyzed the games, finding out the exact formulae of how each battle situation in these games works out, how experience and levels and everything works, and what are the most effective ways to battle. But this movie throws it all out the window, and completes the game almost entirely with one single Pokémon. The player relies on luck, which can be manipulated as he wishes simply by delaying his actions at certain points. Every single attack in this game can miss, including the "never misses" attacks, and as a result, this is a no-damage run: no single harmful attack lands on the Pokémon the player uses. We recommend reading the author's comments on this movie, for he wrote quite a lot of good information regarding this movie.